Blogging blues plaguing my life is something I can definitely do without right now! My "love hate" story with JS-Kit ECHO continues this week with me pulling my hair in frustration at my current plight, which started almost immediately after JS recently upgraded their ECHO Email Notification System. Despite setting my options correctly, it is almost a week now that I am unable to receive ALL my comments here or at my other blogs by email. Why I'm fussing over this is because I now am burdened with the unnecessary trouble of having to check my latest posts for new comments instead of having them delivered to me by email. Very tedious and annoying right? I realize stressing over this is futile. I've come to a point where many things blog-wise are just not going my way and this additional stressor is merely a tick that I refuse to let bring me down. When all else fails, you just gotta laugh and do other things to keep your mind off things! And that's how I ended up changing cursors for Pinky, for the first time ever. I don't usually bother with trivial things like changing cursors but since a kind soul so thoughtfully emailed me this Runescape Cursors link, I decided to check it out. I liked what I saw so I thought I'd share it with you; perhaps a new cursor could give you the inspiration for a nice new post. I'm currently using a magical green fairy as my cursor. Secretly, I am hoping the fairy will soon waves its magic wand and fix all my blog issues and JS problem so that's my little piece of inspiration. With over 20 different cursor categories to choose from, I am sure you'd find one defining your current mood too. 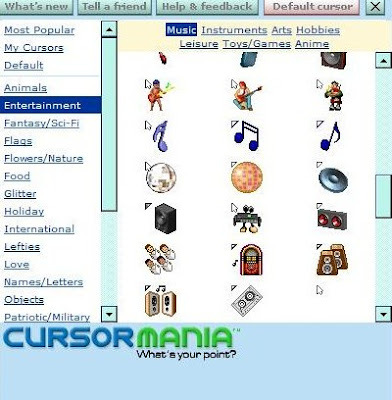 All you have to do is download the file as instructed and you'll be able to view Cursor Mania in your Toolbar after restarting your browser. From there, you just have to click your chosen cursor and it will be ready for use! So which one do you reckon would make it a little better for u today? I kinda like the glittering disco ball, maybe I'll change to funky disco mood next! Oh so that's why I haven't been getting e-mails... JS changed eh? I know it hasn't been the most pleasant of times for you lately in blog land, but at least you can solace in the fact you did make your film debut this month! LOL! I had to say it! You have no control over many of things that have been happening, so it's best not to let it get to you. I wish my PR would go back up, my blogs would be accepted on certain sites that I keep waiting for, more PBs, etc. There's more to blogging than those things even though it's understandable why some get frustrated with it at times. 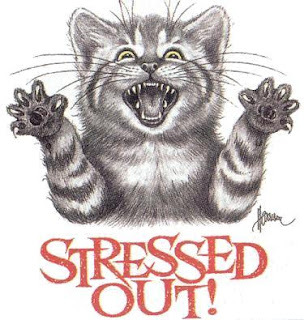 I love the picture of the stressed out cat on your post! I guess it does make sense to keep on smiling and take things in stride. Its certainly healthier. I hope you can fix your email problems soon. I enjoy your blog and have given you a blog award. You can check it out on my blog at www.momtothepowerofthree.blogspot.com. i missed the chop here GP! i ended up settling back to blogger commenting system.. Waiting to see who will take you on in BOTB... let's end that losing streak today!! Vote, vote, vote! Things are definitely still broken around the blogosphere... still only 104 followers for RoxiticusDH on Twitter, now when I tried to leave a comment for you while in BOTB, I got a popup demanding my password to access mymariuca.com... access my A** I just wanted to say hi and vote vote vote! your blog's too slow to load...especially the adgitize widget. maybe the reason is too many widgets. i wanna put la widget oso.hahah!jealous me! yayks!can receive la email edi?syabas! I don dare celebrate yet GG, still unstable here! But I got dis one by email! Things are running a bit on the amuck side for me as well. Stress2x! memang stress. Wah tapi cursor tuu memang syiok la kalau main2 tukar. memang leceh la kalau nak kena buka setiap emel dan nak lihat komen. Patut la tak boleh lihat komen untuk RnR juga. LOL TR widget still not up GG?